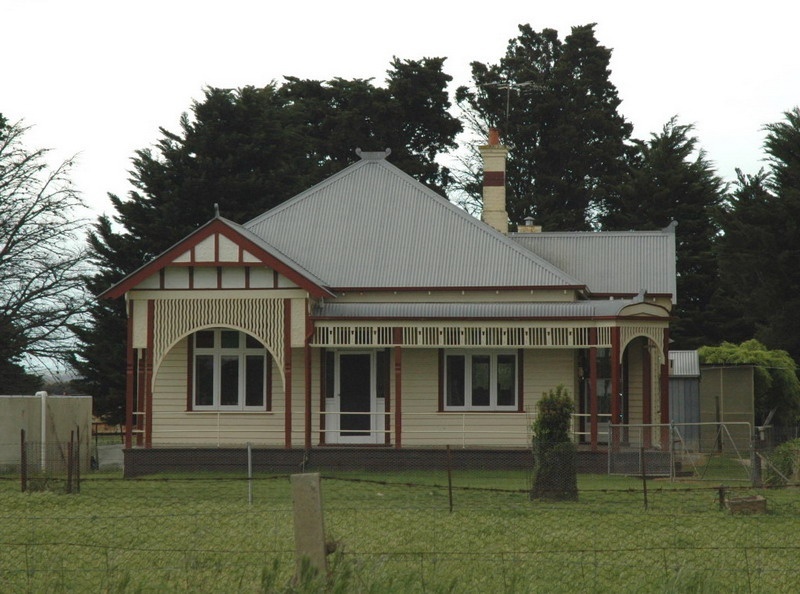 "Lochnaben" at 295 Patullos Road, Lara, has significance as an historical legacy of the Federation era farming developments in the Lara area as a consequence of the Elcho Estate subdivision of 1903, and particularly as one of the more intact and outstanding examples of the Federation style in the local area. Built in 1905 for the Richmond brothers (James, Frederick and Joseph), successful crop growers, the property has long-standing associations with Benjamin Spalding, sheep farmer, between c.1910 until his death in 1967, when it passed to his son, Selwyn. The fabric that contributes to the significance of the dwelling includes the single storey height, asymmetrical composition, horizontal timber weatherboard wall cladding, dominant main hipped roof form and minor projecting gabled wings to the front and rear linked by a return bullnosed verandah, corrugated profile sheet metal roof cladding, brick chimney with a corbelled top and terra cotta pot, decorative metal finials in the gable ends and main roof ridge, timber verandah posts and decorative timber fretwork valances, splayed corner verandah portico, timber verandah arches and fretwork, banks of timber framed casement windows with highlights, timber framed front doorway with sidelights and highlights and timber door, and the decorative gable infill (timber battening and roughcast panelling). Overall, the dwelling appears to be in good condition and substantially intact when viewed from the road. "Lochnaben" at 295 Patullos Road, Lara, is historically and architecturally significant at a LOCAL level. "Lochnaben" at 295 Patullos Road is historically significant for its associations with Benjamin Spalding who established an enduring sheep farm on the property in 1910, having purchased the land from the Richmond Brothers who had earlier established successful crops on the land from 1904 (Criteria A & H). "Lochnaben" is especially also historically significant as the most intact physical legacy of the Federation era farms established as a consequence of the Elcho Estate subdivision of 1903. "Lochnaben" is architecturally significant as a predominantly intact and outstanding example of the Federation style in Lara (Criteria D & E). It demonstrates several original design qualities reflective of Federation design, being one of the more elaborate examples in the Lara area. "Lochnaben" at 295 Patullos Road is set on a large rural allotment, having a substantial, open grassed frontage to the road. A small front section of the garden adjacent to the dwelling is fenced off. The property is accessed by a driveway on the east side, having a gateway flanking by pointed timber picket fences. The gravelled entry leads to two driveways separated by a grassed island dominated by mature cypress trees. Rows of agapanthus flank the west and east sides of the driveways with another row of cypress trees forming the side (eastern) boundary to the property. At the rear of the dwelling are a number of outbuildings, some of which may be early (on site investigations are required to fully ascertain the provenance of the outbuildings). "Lochnaben" is a single storey, asymmetrical, horizontal timber weatherboard, Federation styled dwelling having a dominant main hipped roof form and minor projecting gabled wings to the front and rear linked by a return bullnosed verandah. At the rear are skillion additions. These roof forms are clad in corrugated sheet metal. The roof also features an early brick chimney with a corbelled top and terra cotta pot, and decorative metal finials in the gable ends and main roof ridge. Modest overhangs and exposed timber rafters are features of the eaves. A particularly distinctive early feature of the design is the return verandah. Located on an elevated timber floor, it is supported by timber posts and has decorative timber fretwork valances. The corner of the verandah is also emphasised by a slightly projecting splayed portico with timber arch and fretwork. A larger arch and fretwork is a feature of the projecting front gable that is supported by paired timber posts with panelled fretwork between them. Other early features of the design include the banks of timber framed casement windows with highlights, timber framed front doorway with sidelights and highlights and timber door, and the decorative gable infill (timber battening and roughcast panelling). The verandah balustrade appears to have been introduced. Overall, "Lochnaben" appears to be in good condition and is substantially intact when viewed from the road.